The Fairmont Resort Blue Mountains is ideally situated in the heart of the Blue Mountains, a UNESCO World Heritage site. Its unique geo diversity offers an exceptional panorama of the Jamison Valley, in a setting that is in harmony with nature. Take a walk through the Australian bush, with a detour to Wentworth Falls, relax at the hotel spa or take part in a large range of activities onsite. 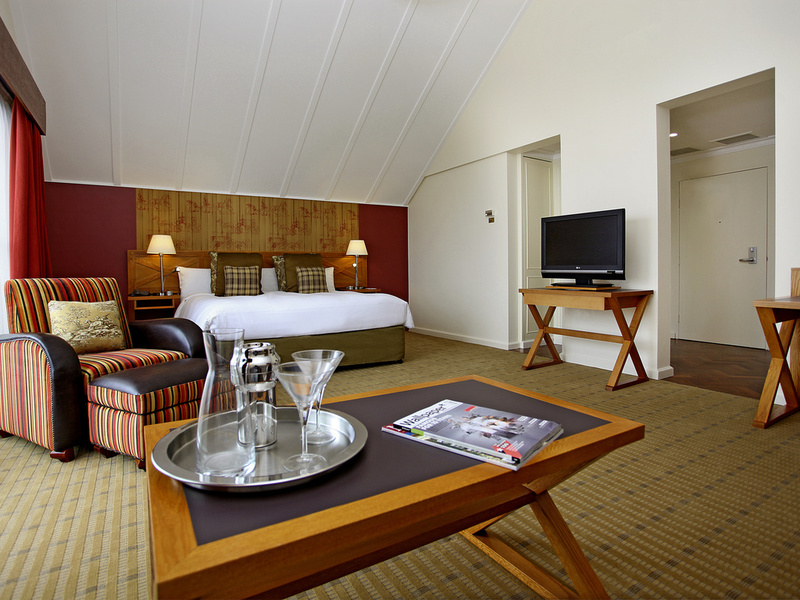 After your Blue Mountains adventure, retreat into the comfort of your Fairmont guestroom. Wake up to a delicious buffet breakfast, showcasing some of the best produce and cuisine of the region. Escape to the serenity of the World Heritage listed Blue Mountains. Tucked away with sublime mountain views, we welcome you through our unique choice of activities, restaurants and onsite facilities. ..
Stroll through 90 hectares of lush gardens, past waterfalls, lakes and local wildlife. With an express choo-choo train and a merry-go-round, KidsZones don't get better than this! Sublime Point Lookout features misty mountains and rolling valleys as far as the eye can see. Lose yourself for a while in the sapphire haze emanating from the dense bushlands that envelop the Blue Mountains. An exclusive bushwalking experience gives you a peek into the untamed nature of this exceptional setting. Follow your personal guide through rainforests, valleys and tablelands as you learn about the regional flora and fauna. Treasure moments of rare delight along your way and transform them into unforgettable memories. Such is the MGallery philosophy. Back at the resort, the commanding views of Jamison Valley take on new depths as you enjoy High Tea or a gourmet meal with a refreshing glass of sparkling wine and contemplate your day's exploration. After a blissful night's sleep, wake up to a full buffet breakfast showcasing some of the best regional cuisine. 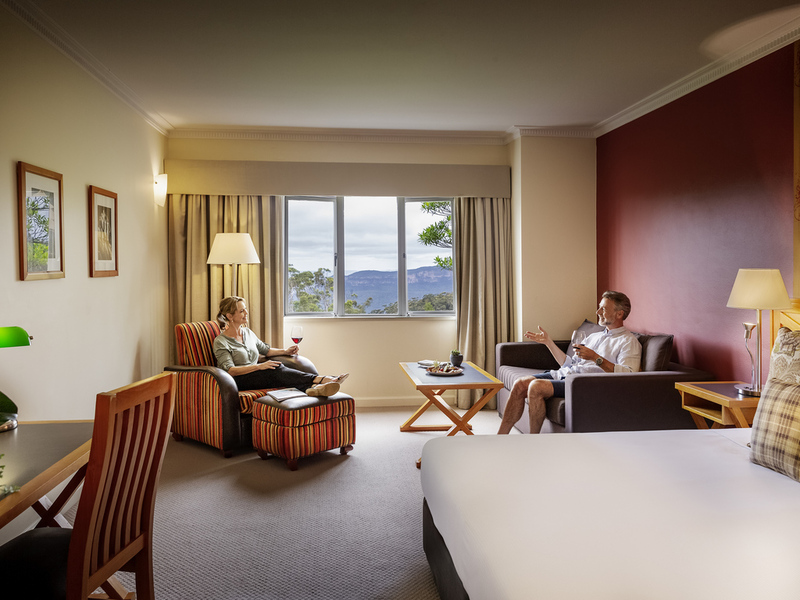 Engage your senses, reconnect and revitalise mind, body and soul at Fairmont Resort Blue Mountains. The Fairmont Resort is located just 90 minutes from Sydney by car. To reach us, follow the M4 Motorway west from Sydney. At Lapstone, the motorway becomes the Great Western Highway, follow the highway through the mountains, turn left into Scott Avenue where you will see the Leura and Resorts sign. Follow the signs to Fairmont Resort, we are just a 5 minute drive from the highway.Trains depart from Sydney Central Station hourly, exit the train at Leura. Taxis are available to take you to the resort. mison Valley, the Blue Mountains National Park, Leura Golf Course and the hotel's gardens and walkways. 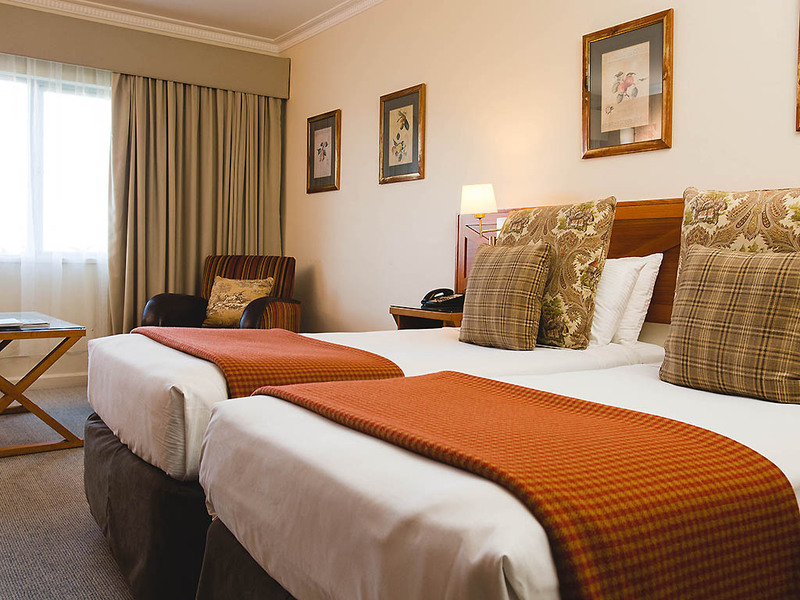 Guests staying at this superb Blue Mountains hotel can enjoy a range of in-room facilities, including a minibar, WIFI access, an LCD TV and ensuite. 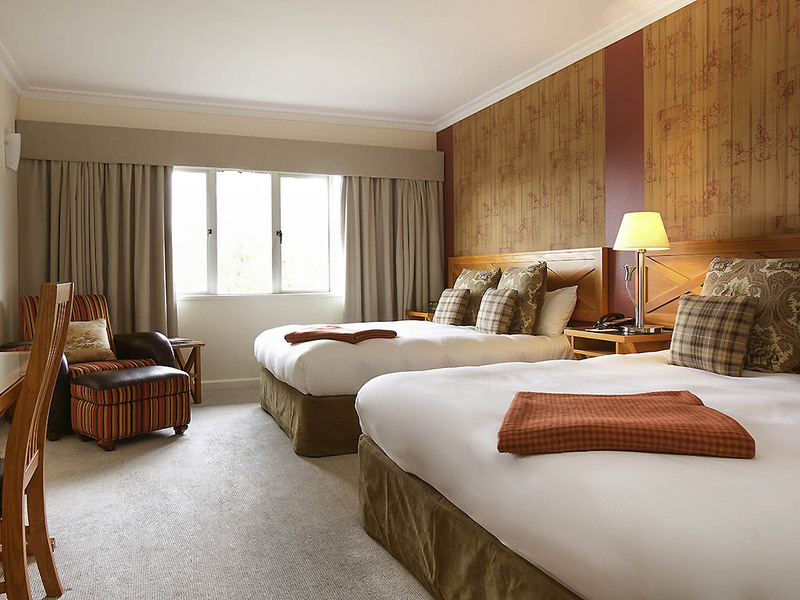 Wake up in one of our spacious suites to majestic views of Jamison Valley or to the melodic chirping of garden birds. After a day's exploration, soothe weary muscles in the spa bath before cosying up in front of the inviting fireplace in the lounge area. Measuring approx. 27m² - Located on levels 1 to 2. Boutique style accommodation with contemporary ensuite, comforting features and space for relaxation. Includes TV with Foxtel, Mini bar, In-room safe, tea & coffee making facilities. Measuring approx. 27m² - Located on level 2. Boutique style accommodation with contemporary ensuite, comforting features and space for relaxation. Includes TV with Foxtel, Mini bar, In-room safe, tea & coffee making facilities. Measuring approx. 27m² - Located on levels 3 to 4. Featuring comforting features and a serene outlook of the valley or resort grounds. Includes TV with Foxtel, Mini bar, Ensuite bathroom, In-room safe, tea & coffee making facilities. Measuring approx. 27m² - Located on level 3. Featuring comforting features and a serene outlook of the resort grounds. Includes TV with Foxtel, Mini bar, Ensuite bathroom, In-room safe, tea & coffee making facilities. Measuring approx. 40m² - Located on the resort's top floor, offering a luxurious spa bath in your over-sized ensuite allowing for ultimate relaxation, with garden views. Includes Nespresso coffee machine, TV with Foxtel, Mini bar, In-room safe. Stay in and relax in the comfort of your own room with our selection of in room dining options. Discover the unique tastes of the Blue Mountains and enjoy gourmet food and wine adventures with an enviable selection of five stunning on-site dining locations designed to meet any mood or occasion. Soak in the rich mountain atmosphere created by the iconic stone fireplace set to a backdrop of soaring floor to ceiling Jamison Valley views in Embers Bar. Enjoy a lazy afternoon by the fireplace or indulge in our delectable High Tea in Sublime Lounge. Indulge in Sublime High Tea, an irresistible selection of homemade treats and loose-leaf teas. Enjoy local flavours and soaring valley views as you dine beside the iconic stone fireplace. Embark on a delicious 5-course journey to discover modern Australian cuisine at its finest. Start your day with a gourmet morning in Jamisons Restaurant with a modern buffet and chef's cooking station. Buffet breakfast is available weekdays 06:30 to 10:00 and weekends 07:00 to 10:30. The Saturday seafood dinner buffet is available from 6pm. With a food philosophy centred around providing simplistic, warm and comforting food with fresh and authentic tastes of the Blue Mountains region and beyond. Experience modern dining and our signature cocktails designed by our inhouse mixologist. Experience a taste of Blue Mountains flavours with our casual dining menu. Enjoy a meal by the iconic stone fireplace for lunch or dinner. Soak in the rich mountain atmosphere created by the fireplace set to a backdrop of Jamison Valley views. The perfect venue to indulge in our delectable High Tea or enjoy a glass of fine Australian wine whilst immersing yourself in the panoramic views of the resort grounds. Taste our unique Sydney Brewery beer whilst grazing in front of the dual fireplace. Featuring extensive leisure, dining and conference facilities, Fairmont Resort Blue Mountains provides the perfect setting for meetings, conferences and events in the Blue Mountains, with ability to accommodate up to 850 delegates in a range of layouts. With its spectacular location in the Jamison Valley and its extensive array of event space, accommodation, leisure and dining facilities, there is no better setting for unforgettable, beautiful Blue Mountains weddings than Fairmont Resort Blue Mountains. Indoor Pool including Spa and Sauna, Outdoor Pool, Ubika Day Spa with 16 treatment rooms, Library, Billiards Room, Lobby Shop. There is a dedicated wedding co-ordinator. Fairmont Resort & Spa offers various venues for weddings. Spend your first days of newlywed bliss in the fairy-tale setting of the Blue Mountains. Stroll through the hotel's lush gardens and take in enchanting valley views. There's true magic and romance in this unforgettable honeymoon destination. On warm summery days, relax on the stunning deck by the outdoor pools and take in a few laps under the cerulean sky. Or swim in the heated water of the recently refurbished indoor pool before settling into the hot tub.